Various listeners have asked us here at Everyman Studios about how many international (Indigenous) listeners we reach due to the programme’s limitations within the English language. We were curious too, so we concocted an idea to reboot the traditional QSL card by adapting it to the podcast/IPhone era. You can load the QSL (png) into your favourite image editor or word programme; (Windows/Mac/Linux) fill in the date(s) you heard the show; (and time, if heard on pirate radio) how you heard it over the WWW or over the airwaves and send it back to us! Or, you can take a snapshot and print the QSL image; fill out the info by hand; take a photo of it (and yourself w/ it if you really want to – please use discretion) and send it back to us that way! 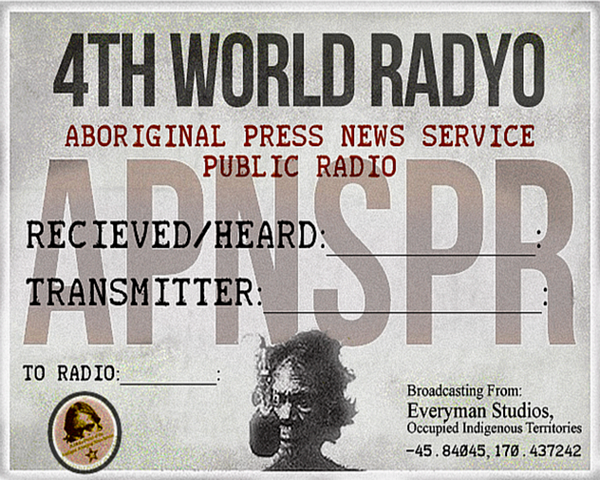 We plan to post returned QSL’s on aboriginalradio.wordpress and mention QSL responders and progressive/independent radio stations/groups that carry the show during broadcasts! Thanks for Listening and Good Tidings for the Coming Year!